Hats and Rabbits: "Offer it up!" I don't think this is St. Theresa, but you get the point. It's easy to trash religion as a negative force in the world. If you look at the headlines, it is a negative force. If you look at the historical headlines, even, it is a negative force. But those who were raised in sane religions with love and peace at their foundations know that religion can be profound, comforting and spiritually (go figure...) uplifting. "Whatever you do, offer it up to God and pray that it may be for His honor and glory." She uses it in the broader sense, of course. Hers is a prescription for living for God, first, but I find Catholics tend to use it more as a mitigation of and to make meaning out of suffering, either minor or major. What it comes down to is that if someone is suffering a bad day or has a task to do that is unpleasant or if a person is sick or physically "dragging," he or she is instructed to "offer it up" to God. Take it as a tiny cross to bear and bear that cross in thanks. I don't care who you are or what you believe. That's cool. It can be secularized, too. One can offer one's suffering or discomfort in thanks for the gifts of Fate or of the Universe or whatever one feels drives the tides of life; as a kind of a balancing tool that reminds one that this present inconvenience is little compared to the many good things in life. And depending on one's inner constitution, one can offer up the simplest discomforts or the most life altering tragedies. One can offer it up or one can offer it outward... Maybe offer a bad dining experience, and the anger it makes one feel, in the name of those who have no food at all. It's a great perspective incentive at the least. 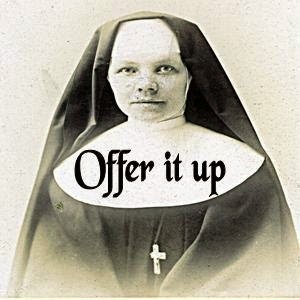 And if one does believe in Jesus, "offering it up" is certainly a good habit to get into; a tip of the hat to the Big Guy, once in a while, couldn't hurt. Yes, we read about the negatives all of the time, but in your average town parish or synagogue or mosque or temple, regular people commune in order to find hope and sense in the world that continually tries to prove itself to be the Hell everyone is trying to avoid in the first place. Raising voices skyward, wherever directed, can't be all bad. It's good to acknowledge our indebtedness to things bigger than us and, without which, we could never have existed. Next time you stub a toe, offer it up to whatever Force you happen to believe in. It feels pretty good.